Somewhere between 20% and 30% of traffic to many websites is now coming from mobile devices, depending on the category. In specific local categories the number is as high as 50%. Why is this the case and what must happen to realize the promise of “LoMo” advertising? Join Monica Ho, xAd Vice President of Marketing and Opus Research's Senior Analyst Greg Sterling for a discussion of the opportunities – and challenges – of locally targeted mobile advertising today. Sterling will provide findings on consumer preferences for localized advertising as well as performance data comparing local-mobile ads to national ads. 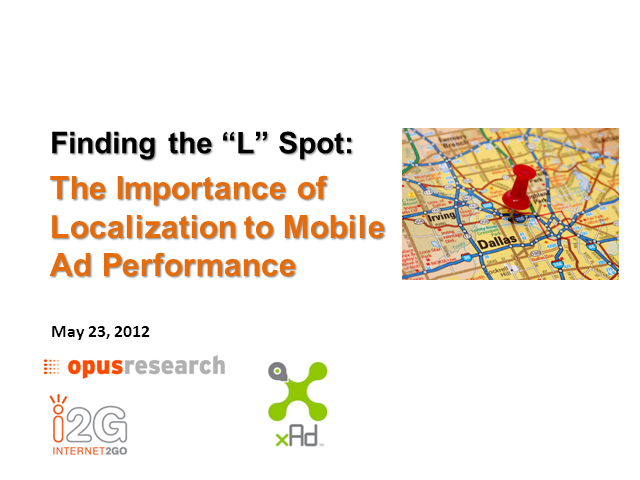 He’ll also present a recent case study comparing ad performance across five mobile ad networks. xAd’s Monica Ho will talk about the opportunities and challenges of location targeting .She’ll also present the 5 mobile marketing best practices that every marketer/agency should know in order to drive true performance out of mobile advertising.